Not another banana bread recipe. and banana bread makes such an excellent (and not too junky) snack. perfect when you are short on time. The same recipe as above but with the addition of awonderful streusel topping I came by from a dear friend. chip crumb topping because, really, why not? must have a chocolate version. And in that same line, everything in my life must also have a Nutella version. appreciate having this in your arsenal. – Whisk together flour, sugar, baking powder, baking soda, and salt in a bowl. this up with milk until it reaches 1/3 cup, stirring well. Let this stand for about 5-10 minutes. combined. Spread the batter into a buttered loaf pan. comes out clean. Cool in the pan for 10 minutes, and then finish cooling on a rack. said, this is absolutely fine on its own. coffee or tea, and is perfect to tuck into someone’s lunchbox. I hope you are all having a restful weekend, filled with all sorts of good things, banana bread optional, to fuel you through to the next week! THANK YOU! FINALLY! I have been searching for a one-banana banana bread recipe forEVER!!!!!! I even have one banana languishing on the counter right now!!! 😀 Thank you! Perfect! I always have a banana or two languishing by the end of the week. Looking forward to trying this out soon. Can you believe in never made a banana bread before? And I do love them but with a boyfriend who is allergic to banana it just never happened. This looks totally delicious. Maybe I should give it a try! Hi Lauren! So glad to have helped! Hi Anonymous person 🙂 Hope you like it! Now, making banana bread with just one banana's quite an interesting notion. Unfortunately, bananas don't last at all that long at our house, so I doubt if I'll ever be able to make this! Hi Midge! Sigh…we *always* seem to have an odd banana left! This recipe is in my weekly roundup of the most inspiring recipes! Thanks for including me Redd! Love fruit breads. 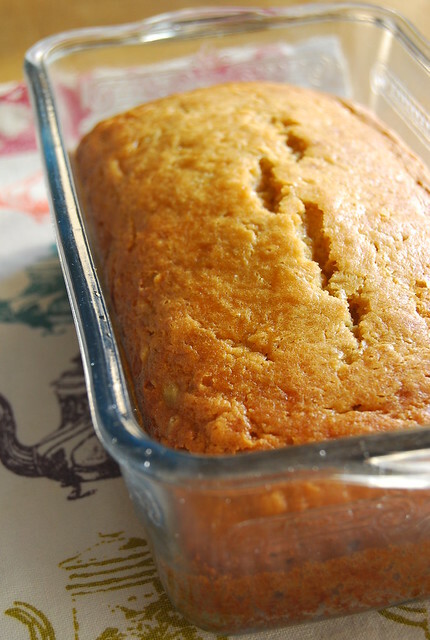 Thanks for sharing this banana bread recipe. This was perfect. I also threw in some coconut and a few chocolate chips. So glad to have a recipe now that calls for just one banana. Thank you! I'm about to try your recipe, and I'm going to replace the milk/yogurt with applesauce! I've been obsessed with trying this with everything lately, hope it turns out! I added chopped walnuts, dried mixed betteries and used strawberry activia yogurt. It turned out so tasty! Thanks for the recipe! I added chopped walnuts, dried mixed berries and used strawberry activia yogurt. It turned out so tasty! Thanks for the recipe! this is my fav. banana bread recipe thanks! Exactly what I am looking for this morn!! Thanks =) I might have to add a few chocolate chips in there hehe..